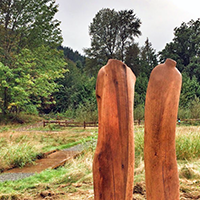 "A Century of Dairying in Issaquah"
Location: Darigold, 611 Front St. N.
Location: Cornick Park, 335 Front St. S.
"Forest Carvings," which is comprised of three carved cedar poles, pays homage to the naturally felled wood. Artist Steve Jensen, who comes from a long tradition of Norwegian fisherman and boat builders, uses chisels that were passed down from his grandfather. The craftsmanship of the work speaks to the universality and timelessness of carving. The late Harvey Manning was a local preservationist, conservationist, and noted author of hiking and trail guides. He played an important role in the preservation of the North Cascades National Park, Alpine Lakes Wilderness Area and Cougar Mountain Regional Wildland Park. Manning was also an early advocate of the Mountains to Sound Greenway. The memorial statue, which was commissioned by the Issaquah Alps Trails Club, sits on several boulders that were excavated from Manning's property on Cougar Mountain. 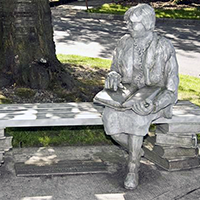 The sculpture is a life-size tribute to former City Clerk Linda Ruehle, who retired in 2001 after 30 years of service to the City and community. 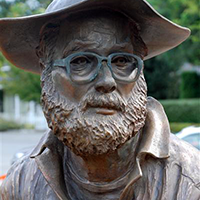 Artist Richard Beyer is best known as the creator of the beloved sculpture "Waiting for the Interurban" in Seattle's Fremont neighborhood. 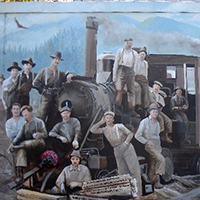 The mural depicts Issaquah's logging industry from 1900-40, when old-growth cedar and fir logs were cut from the surrounding mountains and milled in the town's many lumber mills. Before 1960, Sunset Way was named Mill Street, referring to the mills located on either end of the street when the town was incorporated in 1892. 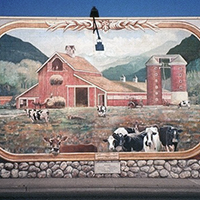 The mural was sponsored by the Issaquah Arts Commission, Greater Issaquah Chamber of Commerce, Downtown Issaquah Plaza, Issaquah History Museums, Downtown Issaquah Association, Front Street Market and Ben Franklin. 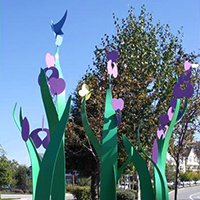 "Miracle Grow" consists of four individual powdered coated steel sculptures, ranging in height from 8 feet to 14 feet. Artist Leon White was inspired to create "Miracle Grow" by observing the plants in his garden, especially the long leaves of the iris. Artist Brandon Zebold has had a passion for drawing since childhood — and, of all the media he explored, he feels steel offers the most exciting range of shapes and surfaces on which to draw. In an effort to capture the organic, free-associative tapestry of his drawings, Zebold began cutting them into and out of rugged-yet-yielding steel. 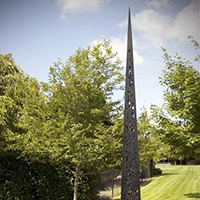 The process of rendering the steel drawings became a natural springboard into sculpture. Born and raised in Port Angeles, artist Craig Breitbach's sculptures are generally realistic images of salmon, combining his love of art with his passion for fishing and nature. He works in many different stone types, but prefers basalt (as in "River Run") for larger pieces because of its contrasting textures. "Shadowmaker," a kinetic sculpture installed on the traffic island within Central Park, establishes a focal point for the park. 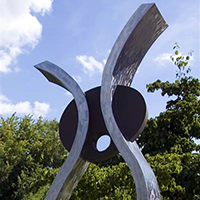 As the viewer approaches the sculpture, the rectangular opening of the piece provides a framed vista, drawing the eye through the sculpture to the view beyond. The base is designed in a circular format that bolts to an industrial-sized bearing system that functions as a kind of Lazy Susan. Location: Eastside Fire & Rescue Station 72, 1575 N.W. 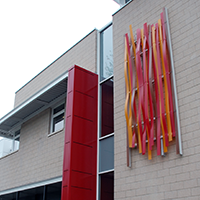 Maple St.
"Solace" is a solar-powered artwork designed for Issaquah's LEED Platinum-certified Eastside Fire & Rescue Station 72. Designed around the theme of order and chaos, the work is constructed of recycled eco-resin, in keeping with the green design of the building. "Solace" is lighted at night. 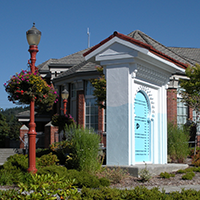 "The Blue Door" is a gift from Issaquah's sister city Chefchaouen, Morroco. Designed to look like doors built 200 years ago in northern Morocco, it symbolizes the friendship and hospitality between our two cities. In 2008, the work was unveiled and dedicated by then-Mayor Ava Frisinger and a delegation of visitors from Chefchaouen. Location: Squak Valley Park, 10319 Issaquah-Hobart Road S.E. Carved from cedar, "The Couple" captures the essence of human gesture from a tree, using only the minimum definition required. Artist Michael Dennis intends that in one piece the viewer may see both human form and the form of the tree. 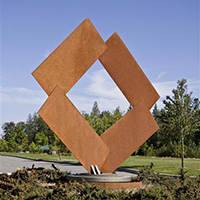 The first outdoor sculpture commissioned by the City of Issaquah, "The Dig" was chosen by the Issaquah Arts Commission to commemorate the City's 1992 centennial. 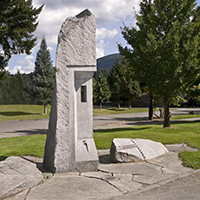 The main piece of the sculpture, which resembles a mine entrance, is carved out of 15,000 pounds of gray granite taken from the Cascade Mountains. 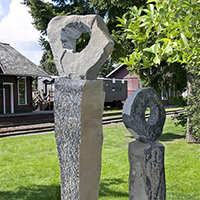 Symbolic imagery is carved into the stone, including a mine portal, salmon, railroad track, bits of riveted locomotive boilers and a railroad spike. 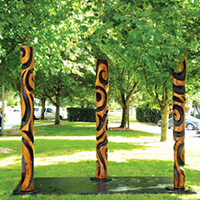 "The Pillars" consists of individually sculptured basalt monoliths. Varying textures integrate smooth and rough surfaces, creating intriguing duality in the stone. 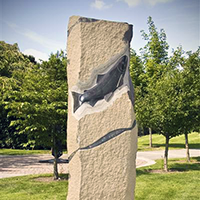 Artist Will Robinson encourages viewers to touch his work; engaging with the stone creates a connection between the medium, artist and viewer. 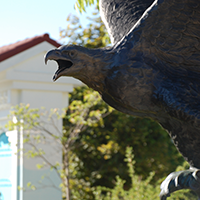 Artist Doug Eck created the one-and-a-half-times life-sized eagle and salmon to illustrate the struggle for survival in the wild. 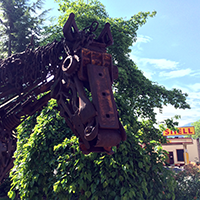 The bronze sculpture also was designed to illustrate the valiant effort of the Issaquah Police Department. 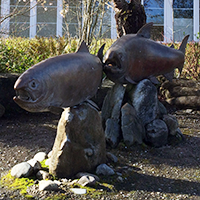 Artist Larry Kangas designed the piece with suggestions from Friends of the Issaquah Salmon Hatchery. 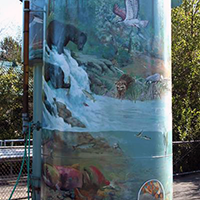 The mural depicts salmon at different life stages, creatures eaten by salmon and creatures that prey on salmon. "Wing on Wing" is constructed from recycled steel with enamel paint accents. The artwork is 14 feet high, 3 feet wide and 3 feet deep. 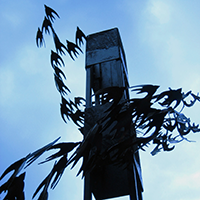 The sculpture features an architectural column, creating a totem of sorts, with a flock of swallows assembling into flight at its apex. 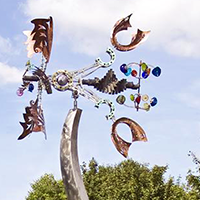 "Zephyr" is a mixed metal and glass sculpture. The top is kinetic, moving with the wind and is No. 6 in a series of 10 sculptures. Artist Andrew Carson executes every step of the process, including design, engineering, prototyping, metal cutting, pounding and finishing, as well as glass and cement casting. There are no found parts in Carson's work; he designs and makes every piece, including the glass balls, hubs and the transitions.